When Dr. Siba Povogui and his colleagues in Guinea's capital city of Conakry heard what was happening in their home village of N'zénié, they had to do something. As many as 65 people in the community of fewer than 500 had died from the Ebola virus in only 2 months. 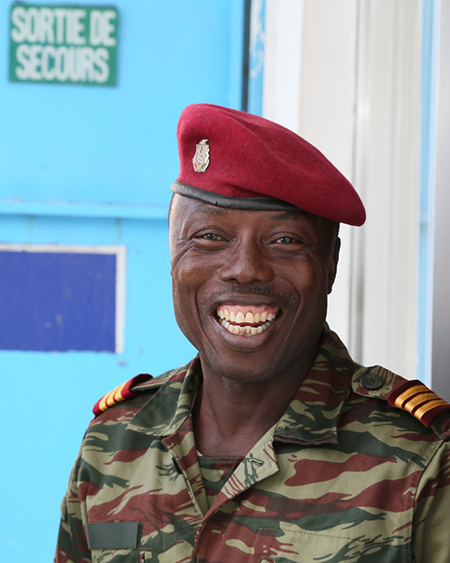 "We knew everyone who died," the Guinean army doctor says with a heavy sigh. "We wanted to save our home. It's where we grew up." They came to Catholic Relief Services for help. A close-knit community, N'zénié is situated deep in Guinea's Forest Region. Ebola was quickly wiping out entire families. The doctors each had expertise that could help. But visiting N'zénié would be easier said than done. To avoid becoming infected with Ebola, they would need protective equipment, including gloves, face masks, head covers, disposable waterproof gowns and reusable rubber boots. "We visited a lot of different groups," says Dr. Povogui. "But it was difficult to get the necessary support to go back home." When the doctors approached CRS, we were well into our Ebola response in Guinea, launching a program to train more than 3,000 health care workers on how to use protective equipment that can prevent Ebola transmission. Godlove Ntaw, the country representative for CRS Guinea, was moved by the doctors' plea. "When we heard their story, it was a mourning ceremony," he says. "We were compelled to help." 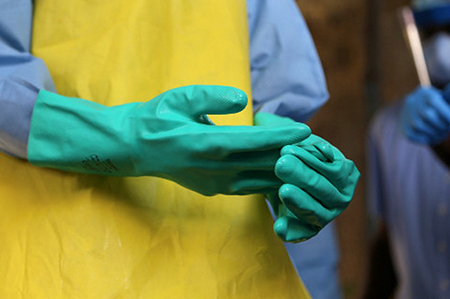 When working with people that might have Ebola, protective equipment can save your life—or get you killed. One mistake putting it on or taking it off can lead to infection. Training would be essential for Dr. Povogui and his fellow colleagues. CRS and our local partners, including the Pharmacie Centrale de Guinée, secured enough medical equipment to fill several vehicles. And we organized a thorough training so the doctors were comfortable using protective equipment. "We practiced until they got it right," Godlove says. But although the doctors were on a lifesaving mission, it was difficult to predict how people in the village would react to seeing them. "The village was relentless. It had already kicked out government officials and nonprofit organizations that wanted to provide assistance," says Dr. Alphonse Béarogui, a colleague. "The other surrounding communities wouldn't let people in or out because they were afraid of getting sick. Nobody went in … Nobody went out." Numerous misconceptions and fears about Ebola have thwarted efforts to contain the outbreak. Some believe that humanitarian food has been deliberately infected with Ebola. Chlorine, used to kill the virus, is widely believed to be poison. Many are skeptical that Ebola is the disease that's killing people. Such beliefs cause people to become scared or suspicious when they see a white car with an international organization's logo. What proved to be critical was that these doctors were going back to their hometown. "We went to the village, and there was a certain level of trust right away," says Dr. Povogui. "Villagers didn't think we would trick them, since this is our home too." The doctors, who mainly treated non-Ebola diseases while encouraging people to seek testing and treatment for Ebola in the nearest city, stayed in N'zénié for about a month. The situation improved quickly. Several villagers who were sick and feared they had Ebola actually had malaria and fully recovered with treatment. But the story these doctors tell about N'zénié shows that the impact of the Ebola outbreak will be felt long after there are no longer cases, even as the virus continues to spread in Guinea. "Schools have reopened, but orphans are left behind," Dr. Povogui says. "There is a big problem of stigma." Survivors and families who have lost someone to Ebola often face rejection in their community. In Guinea, CRS continues to maintain a strong relationship with communities affected by Ebola, and will continue supporting those in need. "At first, we thought we would die. We actually didn't expect to live," says Dr. Siba Grovogui, another doctor who made the journey to N'zénié. "But we were only able to face the sick because of the confidence we received from the training. They were very good and useful."